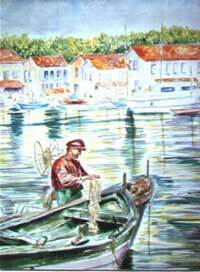 Guiseppe was a fisherman who lived in a small fishing village off the coast of Italy and each day he would take his little "boat-a" and go fishing. And, Guiseppe would catch the biggest fish, and the freshest fish and he would take his catch to market and he would get "lots-a" money which he would take home to his "wife-a", but all she would say was, "yap yap yap, nag, nag, nag, bitchy, bitchy, bitchy, oh poor Guiseppe! But every night she would make a "love-a" like no other woman! She was absolutely "Wowie Cowie!" But in the morning, all she would start the day with, "yap, yap, yap, nag, nag, nag, bitchy, bitchy, bitchy, oh poor Guiseppe! And, Guiseppe would run out of his villa and he would get into his "boat-a" and he would start rowing out to sea saying, "Some-a-day, I'm-a gonna leave-a that-a woman!, Some-a-day, I'm-a gonna leave-a that-a woman!, Some-a-day, I'm-a gonna leave-a that-a woman!" But, like every other day, Guiseppe would get out to sea and would catch the biggest fish, and the freshest fish and he would take his catch to market and get "lots-a" money which he would take home to his "wife-a", but all she would say was, "yap yap yap, nag, nag, nag, bitchy, bitchy, bitchy, oh poor Guiseppe! But, like every other night she would make a "love-a" like no other woman! It was "wowie cowie!" But once again, in the morning, she would start the day with, "yap, yap, yap, nag, nag, nag, bitchy, bitchy, bitchy, oh poor Guiseppe! And, like every other day, Guiseppe would run out of his villa and he would get into his "boat-a" and he would start rowing out to sea saying, "Some-a-day, I'm-a gonna leave-a that-a woman!, Some-a-day, I'm-a gonna leave-a that-a woman!, Some-a-day, I'm-a gonna leave-a that-a woman!" Now on this particular morning, Guiseppe learns that it is the "quinn-centenary celestial equinox" of all fishing days! "Oh the excitement!" Furthermore, Guiseppe noticed that his "boat-a" was perfectly aligned at a right angle to the sun and to the moon. The wind was a calm breeze blowing from the north, and the south, as well as from the east and the west! At once, Guiseppe knew it was the most perfect day for catching the ultimate catch and this would surely make is "wife-a" happy. So, Guiseppe reached down and took out his very best fishing "rod-a" -- a diaphanous glass rod equipped with a platinum fishing reel and 1000lb test nylon-silk fishing line spun by virgin silk worms. His bait was a rare and tasty siamese-twin glow-worm which he seduced onto the end of his solid gold fish hook. Guiseppe was so excited, that a little trickle of water ran down his leg! Of course, that very day, Guiseppe caught the biggest fish!, and the freshest fish!, and he took his catch to market and he got "lots-a" money which he took home to his "wife-a", but all she would say was, "yap yap yap, nag, nag, nag, bitchy, bitchy, bitchy, oh poor Guiseppe! Well Guiseppe couldn't take it any longer. He told his "wife-a" that he was leaving her and ran out of his villa to his "boat-a". As he rowed out to sea he said, "Ha Ha Ha, I leave-a that-a woman, Ha Ha Ha, I leave-a that-a woman, Ha Ha Ha I leave-a that-a woman." On shore Guiseppe's wife was calling out to him, "Guiseppe, Guiseppe, Please come back, whose-a gonna catch-a all those fish for me?" Guiseppe replied, "Ha Ha Ha, I leave-a that-a woman, Ha Ha Ha, I leave-a that-a woman, Ha Ha Ha, I leave-a that-a woman." Guiseppe's wife called out, "Guiseppe, Guiseppe, Please come back, whose-a gonna bring home all that the money for me?" And Guiseppe replied, "Ha Ha Ha, I leave-a that-a woman, Ha Ha Ha, I leave-a that-a woman, Ha Ha Ha, I leave-a that-a woman." But on shore, Guiseppe's wife-a calls out, "Guiseppe, Guiseppe, Whose-a gonna make-a love to me every night?" Some-a-day, Some-a-day, Some-a-day. Some-a-day I'm going to live my life to the fullest. Some-a-day I'm going to achieve my goals. Some-a-day I'm going be the man or woman I was meant to be. Some-a-day, Some-a-day. Some-a-day. But, I say to you, Lifestream removes the excuse I don't know how and gives us the tools to make life work, to be a centered man, to be a centered woman, to live life to the fullest, to get the best of life AND I'M FOR THAT, HOW ABOUT YOU?